"It pays to think, who needs who: it is neither that wee need the cat or it needs us…"
I am glad to welcome You on the web site of our thoroughbred British cats’ nursery! Not taking into account that our nursery is quite “young”, a ten year experience with cats of British shorthair breed has helped us to shift from amateurs to professionals in what we do. By opening our nursery we gladly want to share with you our enthusiasm and increase the number of people that are being stunned by the might and beauty of this remarkable breed! The main goal of the works on the thoroughbred fullness of our nursery is a steadfast development is the structure of the “plush” fur of the British cat and strengthening of the most harmonic combination of the core exterior factors in the offspring, accepted by the phelinologistists for a particular breed. At the moment, the British cats breed by the wide range of fur colors there are, but we keep to the British Puritan views and have chosen classic monotone colors, which make this particular breed have an inimitable “smartness” from the origin of its species. Sky Blue, Chocolate, Lilac and Black fur colors of our animals contain a natural simplicity, that has been originated by many an ancestor, and, with the background of strict selection of ancestors by this factor, the cats are going to become more bright and deeply colored, what makes any viewer happy and is highly valued by professional experts on cat exhibitions. We try our best get a thoroughbred British offspring at the nursery. There are no Scottish-straights or Scottish-folds in the ancestry of many a cat that we look after. If they do happen to be in the ancestry of any cat, it is usually not higher than in the third or fourth generation. Only this strategy, accepted by the nursery, can guarantee the safety of the thoroughbred indigenous largeness of the purebred Brit, which is his main difference from the other cat breeds. The quality of the works on the thoroughbred fullness in our nursery has been valued on international cat exhibitions. Sky blue British cat Diana, which is the progenitor of the nursery, has received an ICH title at the age of ten months. 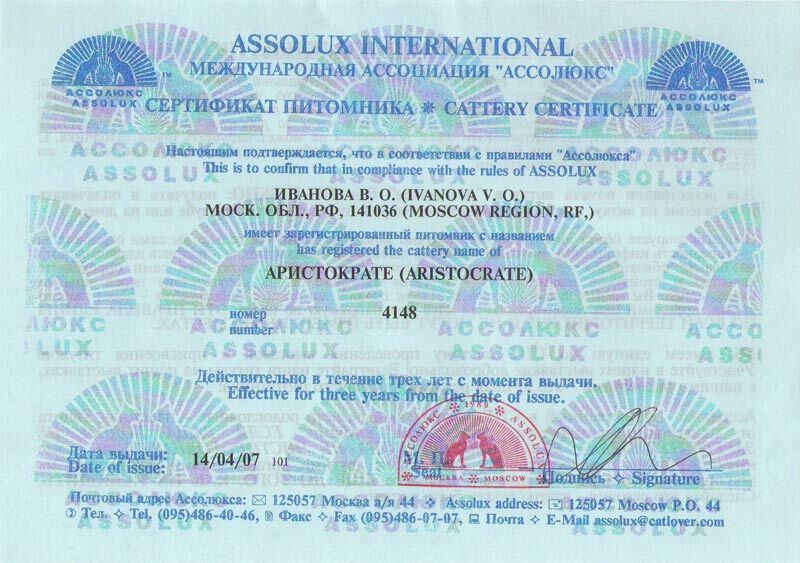 Four sky blue daughters of hers have received CH and ICH title, when two of them have become progenitors of new generation lines in Russian nurseries. Our girls have especially made an impact with the support of the quality and beauty of their fur on international exhibitions. Young British chocolate cat Wallace, that has been bought a while ago for the breeding works in the nursery, has got all of the exterior qualities for the successful beginning of a career on exhibitions since the spring of 2007. In bringing up our offspring we stick to the main principle, which is the following: “The things that have been set up by nature during several centuries are the best for absolute health of any cat!”. We let the cat choose the food it likes by itself. We put ourselves in cats’ shoes: what is tastier: chips or natural potatoes… the choice is always individual, but the more the formula of the dry food is balanced and the closer it is to the natural food, the better for your cat! Outlook of the animal will tell if the diet is right, but not the high price of the dry food. There is nothing easy in bringing up a kitten as well: let the cat be a cat periodically and then your beloved pet will become a sound animal that makes its owner happy by beauty and longevity and being full of life. When buying an animal in our nursery, on the one hand, You will always be able to get qualified help from a phelinologist in questions on bringing up of a kitten and its further exhibition career, and on the other, an experienced vet will help with questions on the health of Your favourite pet. I am glad to have this opportunity to thank the deputy of the British cats’ club Sharonova Olga Konstantinovna for the progenitor of our nursery – Diana, a British cat. 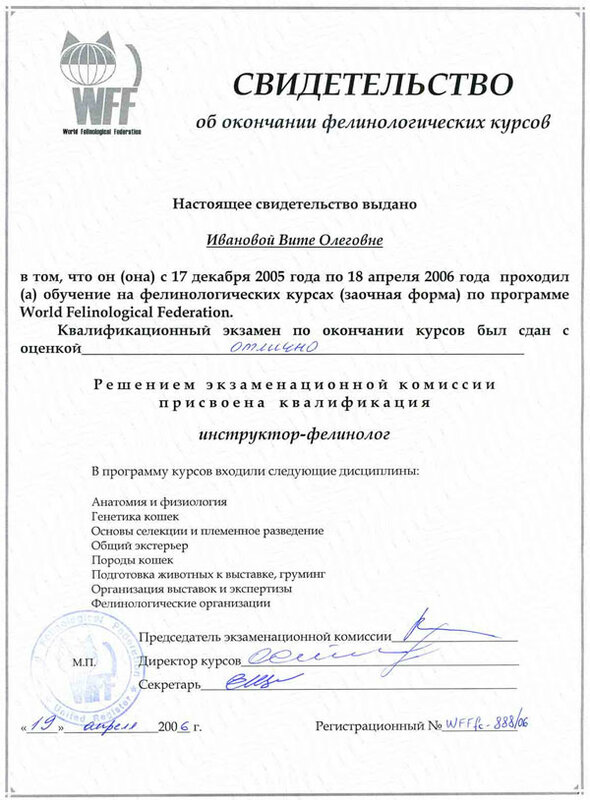 Sharonova Olga Konstantinovna has proved the quality of a professional breeding works of her club and pets by this simple gesture. 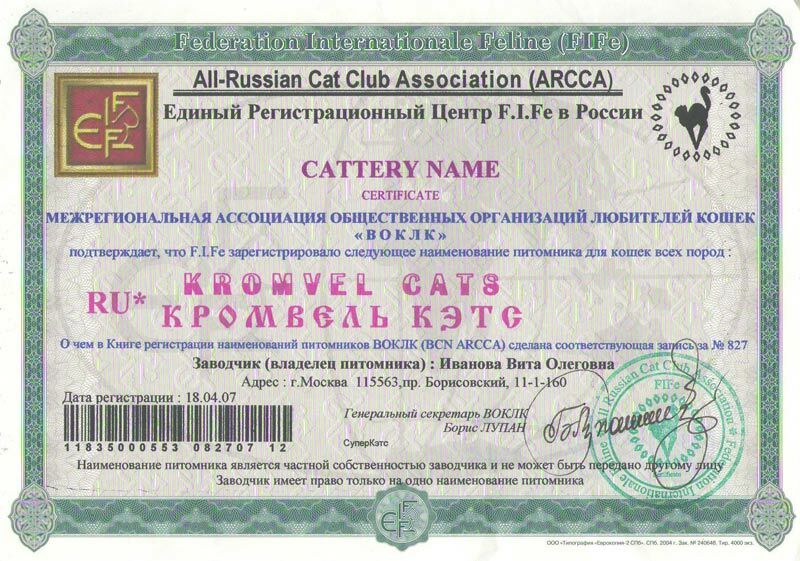 We also thank instructor phelinologist from the British cats’ nursery Silver Breeze Helen Gerasimova for cooperation, who lent us her magnificent British cat Lancelot for breeding. He left the best exterior qualities to our kittens! Also, we gratefully thank North Island ), represented by the main groom person Michael Belov and instructor phelinologist Oksana Belova for the chocolate cat Wallace, which is the main stud-cat of our nursery and also one of the masterpieces of the works on reaching complete thoroughbred fullness in this nursery!